Agathocles (Greek: Ἀγαθοκλῆς, Agathoklḗs; 361–289 BC) was a Greek tyrant of Syracuse (317–289 BC) and king of Sicily (304–289 BC). Agathocles was born at Thermae Himeraeae (modern name Termini Imerese) in Sicily. The son of a potter who had moved to Syracuse in about 343 BC, he learned his father's trade, but afterwards entered the army along with his brother Antander. In 333 BC he married the widow of his patron Damas, a distinguished and wealthy citizen. He was twice banished for attempting to overthrow the oligarchical party in Syracuse. In 317 BC he returned with an army of mercenaries under a solemn oath to observe the democratic constitution which was established after they took the city. Having banished or murdered some 10,000 citizens, and thus made himself master of Syracuse, he created a strong army and fleet and subdued the greater part of Sicily. War with Carthage followed. In 311 BC Agathocles was defeated in the Battle of the Himera River and besieged in Syracuse. In 310 BC he made a desperate effort to break through the blockade and attack the enemy in Africa. In 309/8 BC, Agathocles turned his attention towards Ophellas ruler of Cyrenaica as likely to prove a useful ally in his war against the Carthaginians. In order to gain him over he promised to cede to him whatever conquests their combined forces might make in Africa, reserving to himself only the possession of Sicily. Ophellas gathered a powerful army from the homeland of his wife Euthydike (a descendant of Miltiades), Athens, where many citizens felt disgruntled after having lost their voting rights. Notwithstanding all the natural obstacles which presented themselves on his route, succeeded in reaching the Carthaginian territories after a toilsome and perilous march of more than two months' duration. He was received by Agathocles with every demonstration of friendship, and the two armies encamped near each other: but not many days had elapsed when Agathocles betrayed his new ally, attacked the camp of the Cyrenaeans, and had Ophellas himself killed. The Cyrenean troops, left without a leader, went over to Agathocles. Following several victories he was at last completely defeated (307 BC) and fled secretly to Sicily. After concluding peace with Carthage in 306 BC, Agathocles styled himself king of Sicily in 304 BC, and established his rule over the Greek cities of the island more firmly than ever. A peace treaty with Carthage left him in control of Sicily east of the Halycus River. 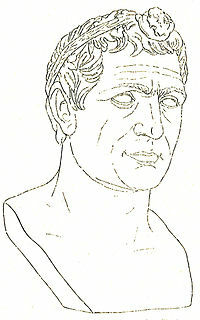 Even in his old age he displayed the same restless energy, and is said to have been contemplating a fresh attack on Carthage at the time of his death. His last years were plagued by ill-health and the turbulence of his grandson Archagathus, at whose instigation he is said to have been poisoned; according to others, he died a natural death. He was a born leader of mercenaries, and, although he did not shrink from cruelty to gain his ends, he afterwards showed himself a mild and popular "tyrant." Agathocles restored the Syracusan democracy on his death bed and did not want his sons to succeed him as king. Agathocles was married three times. His first wife was the widow of his patron Damas by whom he had two sons: Archagathus , who were both murdered in 307 BC. His second wife was Alcia and they had a daughter called Lanassa, who married as the second wife of King Pyrrhus of Epirus, and a son, Agathocles, who was murdered in a succession dispute shortly before his father's death. His third wife was the Greek Ptolemaic Princess Theoxena, who was the second daughter of Berenice I from her first husband Philip and was a stepdaughter of Ptolemy I Soter. Theoxena bore Agathocles two children: Archagathus and Theoxena. Theoxena survived Agathocles. He had further descendants from his second and third marriage. Agathocles was cited as an example "Of Those Who By Their Crimes Come to Be Princes” in Chapter VIII of Niccolò Machiavelli’s treatise on politics - The Prince (1513). It cannot be called prowess to kill fellow-citizens, to betray friends, to be treacherous, pitiless, irreligious. ... Still, if the courage of Agathocles in entering into and extricating himself from dangers be considered, together with his greatness of mind in enduring and overcoming hardships, it cannot be seen why he should be esteemed less than the most notable captain. Nevertheless, his barbarous cruelty and inhumanity with infinite wickednesses do not permit him to be celebrated among the most excellent men. are applied at one blow and are necessary to one's security, and that are not persisted in afterwards unless they can be turned to the advantage of the subjects. However, he came to "glory" as much as he did brutality by repelling invading Carthaginians and winning the loyalty of the denizens of his land. ^ a b Habicht 1998, p. 95. Diodorus Siculus Library of History Books 19-21. Justin, Epitome of Pompeius Trogus Book 22. This article incorporates text from a publication now in the public domain: Chisholm, Hugh, ed. (1911). "Agathocles" . Encyclopædia Britannica. 1 (11th ed.). Cambridge University Press. p. 370. Tillyard, H.J.W. (1908). The History of Agathocles. Cambridge: CUP. Meister, Klaus (1984). "Agathocles". In Walbank, F. W.; Astin, A. E.; Frederiksen, M. W.; Ogilvie, R. M. (eds.). The Cambridge Ancient History: Volume 7 Part 1. The Hellenistic World (2nd ed.). Cambridge: Cambridge University Press. pp. 384–411. Bennett, Chris. "Family of Agathocles". Retrieved 21 July 2018. Consolo Langher, Sebastiana Nerina (2000). Agatocle: da capoparte a monarca fondatore di un regno tra Cartagine e i Diadochi. Messina: Di.Sc.A.M. ISBN 978-88-8268-004-6. Schubert, Rudolf (1887). Geschichte des Agathokles. W. Koebner. Berve, Helmut (1953). Die Herrschaft Des Agathokles. Munich: Bayerischen Akademie der Wissenschaften. Lehmler, Caroline (2005). Syrakus unter Agathokles und Hieron II. : die Verbindung von Kultur und Macht in einer hellenistischen Metropole. Berlin: Verlag Antike. ISBN 978-3-938032-07-7. 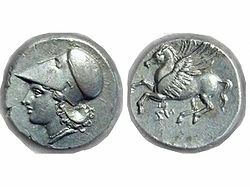 Wikimedia Commons has media related to Agathocles of Syracuse.